Located in the heart of everything Sydney has to offer, Pullman Sydney Hyde Park is just minutes from city shopping, the Harbour, the Opera House, Darling Harbour, Oxford Street, Paddington restaurants and the city's vibrant nightlife. Windows on the Park Restaurant with endless views of Hyde Park lawns and trees, is the perfect spot to enjoy a superb breakfast or dinner. Bar 36 is a lively meeting spot, and is open early morning to late evenings, Monday to Saturday. Clients, friends, coffee, pre-dinner cocktails, after theatre drinks ... whatever the occasion or reason to celebrate, it's always the place to rendezvous! Recreation facilities include Rooftop recreation deck with magnificent views of the city skyline and Hyde Park, outdoor swimming pool, sundeck, spa, sauna and fully equipped gymnasium. Located opposite Hyde Park - ideal for jogging and walking. Pullman Sydney Hyde Park is a non smoking hotel. 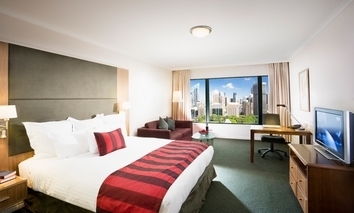 At 32sqm, our Deluxe Rooms are amongst the most spacious in the CBD. 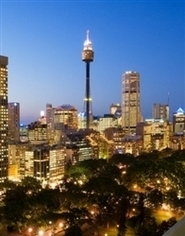 Room features views over East Sydney, lounge area, toaster, microwave & large corner bath. Includes access to rooftop pool, spa, sauna and gymnasium. At 32sqm, our Deluxe Rooms are amongst the most spacious in the CBD. Room features stunning views over picturesque Hyde Park, lounge area, toaster, microwave and large corner bath. Includes access to rooftop pool, spa, sauna and gymnasium. Newly refurbished in late 2011, our Executive Rooms are located on the top two floors of the hotel. 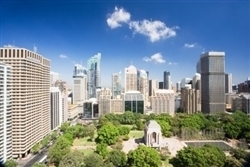 Rooms feature views over Hyde Park, Woolloomoolo Bay or East Sydney and include toaster, microwave, lounge and large corner bath. Rate includes access to Executive Lounge, serving complimentary drinks and canapes nightly between 5.30-7.30pm, desserts between 7.30-9.30pm PLUS continental breakfast daily. Also includes access to rooftop pool, spa, sauna and gymnasium. At 54sqm, enjoy the luxury & space of a superb Junior Suite featuring Marriott's signature Revive bedding, views over Hyde Park or Woolloomooloo Bay, corner spa bath, separate living area & kitchenette! Spoil yourself! All rooms have high speed Internet access for travellers with laptops. In addition we have computers with Internet access and Microsoft programs in the the lounge, adjacent to the front desk. Secure under cover parking is available at a charge of $45 per night with unlimited entries and exits. Drive up to the front of the hotel for valet parking. From the CBD we are just a minute's walk across the park. If driving, follow the signs into Sydney and either drive up Park Street or Macquarie Street to intersect College Street. The hotel is on the southeast side of Hyde Park, where Oxford Street meets the city. 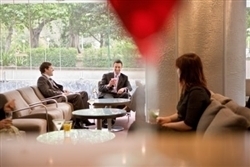 This stylish hotel located in the heart of Sydney, is just minutes from transport, shops and major attractions. 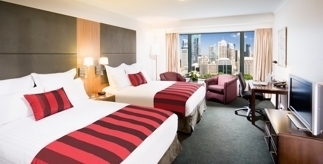 Located in the heart of everything Sydney has to offer and overlooking Hyde Park, Pullman Sydney Hyde Park is just minutes from city shopping, the Harbour, the Opera House, Darling Harbour, Oxford Street, Paddington restaurants and the city's vibrant nightlife. Shopping is just a stroll across the park and you are in the middle of the shopping precinct. Darling Harbour is a ten minute walk, with its unique blend of restaurants and bars. Chinatown is a five minute walk and offers a huge choice of Asian dining options. Oxford Street is right around the corner and provides popular restaurants, bars and nightclubs.